Location: Isola del Cantone, Italy. Notes: The Spinola-Mignacco castle or castle of the Plan was a former noble residence of the Spinola family in town common in today's Ligurian Plan of Isola del Cantone, in the upper Scrivia valley.The historical sources attribute to Captain William II Spinola Decision edification of a new residence, work that took place most probably between 1553 and 1562 and then more late date compared to the castle of Spinola Island. 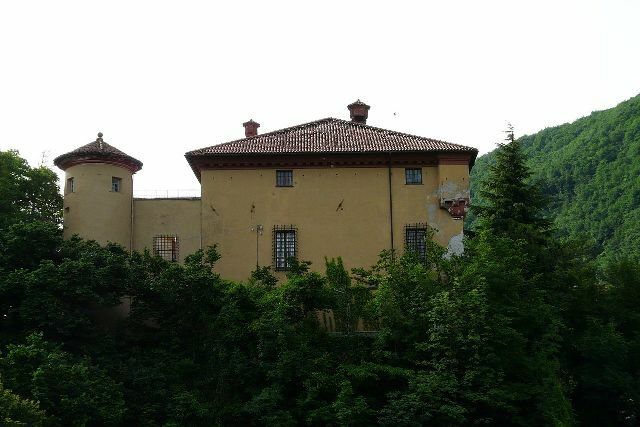 The current Mignacco name was added after the acquisition of the castle, in 1865, by Michele Mignacco and still the property of the castle belongs to the descendants of the family. Intended for residential dwelling rather than a defensive fortress presents on a rocky outcrop near the confluence of the stream Vobbia with the Scrivia, with a square plan. The court of the fort, formed by a thick wall, can be reached through a portal between two circular towers; the main body, also of a square shape, is developed on three levels. Comune di Isola del Cantone, comune.isoladelcantone.ge.it.